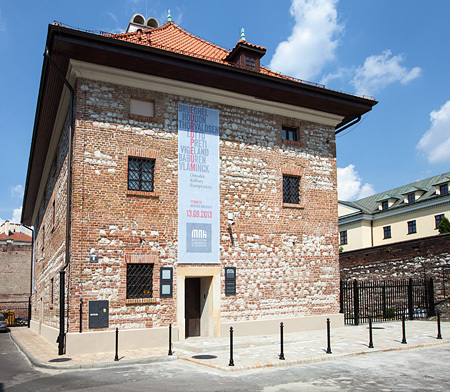 Europeum is the newest branch of the National Museum in Krakow, opened in 2013 in a restored 17th-century granary. Its permanent exhibition is entirely dedicated to European art from past centuries. It features excellent examples of European painting and sculpture. This old granary was previously used by the National Museum as a storehouse. Establishment of the newest branch of the museum was part of the restoration plan of the Sikorski Square, where the granary is located. Over 100 artworks displayed in the Europeum have been in possession of the National Museum in Krakow from its foundation in 1879. They were mostly donated to the museum by private collectors throughout many years. Initially, no specific policy was taken against them since the National Museum has always been focusing mainly on Polish heritage. For many years they had been a part of the exhibition in the Czartoryski Museum. In 2010, after the museum was closed for refurbishment, it was decided that a dedicated exhibition hall should be created for the European art under the auspices of the National Museum. The exhibition covers seven centuries of European art. It includes exceptional artworks by European artists, such as Dirck van Baburen, Pieter Brueghel the Younger, Lucas Cranach the Younger and Lucas Cranach the Elder, Domenico Fetti, Lorenzo Lotto, Nicolaes Maes, Bertel Thorvaldsen, and many more. The idea to establish a museum dedicated only to the European art was to reach far beyond traditional museum activity. Its aim is to conduct the interdisciplinary approach to promoting European art, combining standard exhibitions with events, lectures, workshops, etc.